Adult perched. Note small head and square tail. The Sharp-shinned Hawk is a small hawk and a regular visitor to bird feeders, where it eats birds, not seed. Built to move quickly and quietly within dense forest, the Sharp-shinned Hawk approaches its prey stealthily, until it is close enough to overcome its target with a burst of speed. They breed from central Alaska, across most of Canada and the United States, parts of Mexico, Central America, and in northern South America. They spend the winter from southern Canada through most of the United States, Central America, and the Caribbean. Description: Male and female Sharp-shinned Hawks have similar plumage, but are more different in size than any other North American hawk. Males average only 57% the body mass of females. Adults are gray above with barred, reddish-brown underparts. Their barred tail is long, narrow, square-tipped, and has a narrow white terminal band. During their first year, Sharp-shinned Hawks are brown above, with brown and white streaking on the belly. Adult eyes are red; first year bird's eyes are yellow. In flight, Sharp-shinned Hawks have short, rounded wings that are set slightly more forward on their bodies than those of the larger, but similar-looking, Cooper's Hawk. Weight: 0.2 to 0.5 lbs. Habitat: Large stands of deciduous, coniferous, and mixed pine-hardwood forests and pine plantations. In winter, often found in woodlots, towns, and parks. Diet: Mostly small birds; some large insects and small mammals. Nesting and reproduction: The species' secretive nature, and the dense vegetation of its nesting habitat, makes it difficult to find and study during the breeding season. Clutch Size: 4 to 5 eggs, occasionally 3 to 8. Incubation: Female incubates for 30 to 32 days, while the male brings food to her. Fledging: At 3 to 4 weeks, the young start venturing out of the nest to nearby branches, and begin to fly a few weeks later. Once the young can make sustained flights, the parents pass prey to them in mid-air. The young remain with the parents for another few weeks until they become independent. Nest: Male and female help collect material for the nest, although the female does most of the building. The nest is made of large twigs lined with bark, and is often built on top of an old squirrel or crow nest. The nest is usually well concealed in a dense conifer tree, 20 to 60 feet off the ground. Status in Tennessee: Sharp-shinned Hawks are an uncommon permanent resident, breeding mainly in Middle and East Tennessee. They are much more common in the state in September and October, during fall migration, especially along the eastern mountains. More northerly nesting birds join Tennessee's resident population in the winter. 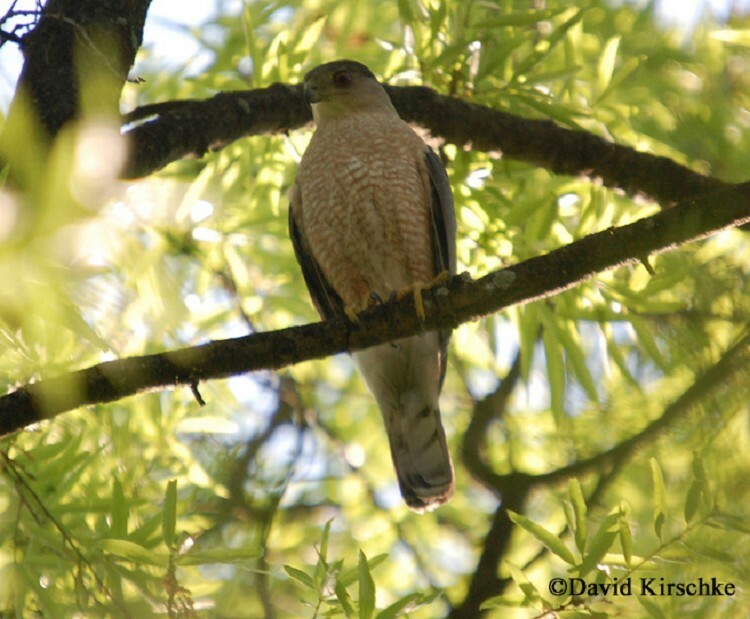 Sharp-shinned Hawks, like many hawks, migrate south following certain landscape features like ridges. Hawk Mountain in Pennsylvania and Cape May Point, New Jersey are two such locations where large numbers of hawks can be seen during the fall. Best places to see in Tennessee: Sharp-shinned Hawks are most easily seen during September and October in the eastern mountains as they migrate south.